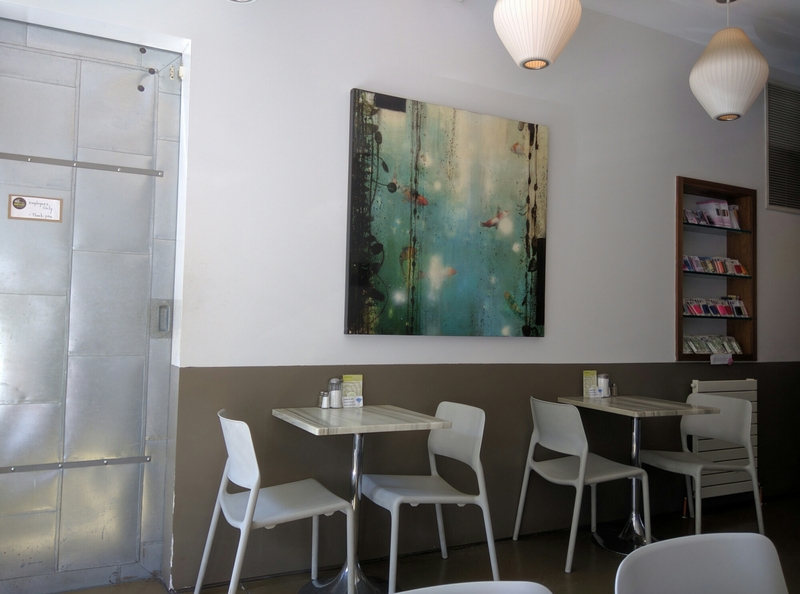 Firstly, this review is on a little cafe situated not in Mississauga, but in the east end Beaches area. 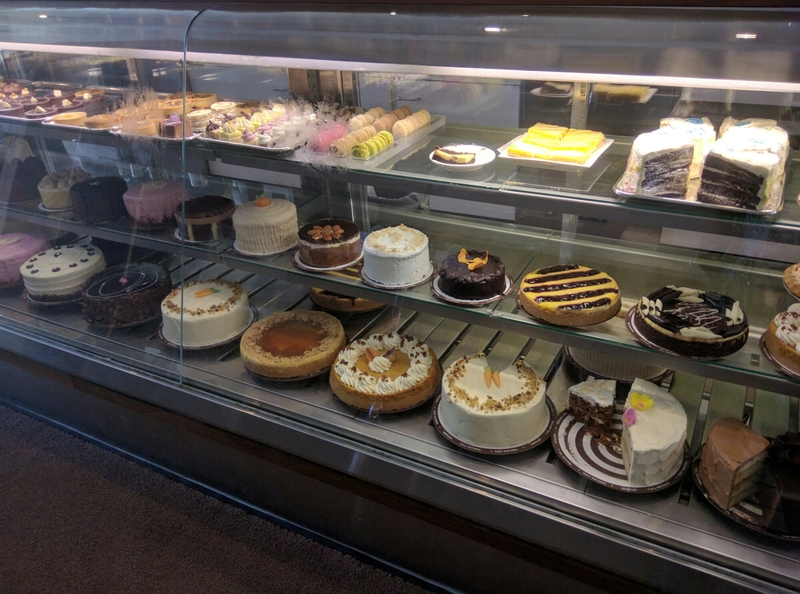 There are a number of Dufflet bakeries around GTA; the head office and outlet is on Norseman in Etobicoke; and we all know that various grocery stores sells cakes made by Dufflet. But who would’ve thought that Dufflet Pastries also serves afternoon tea! 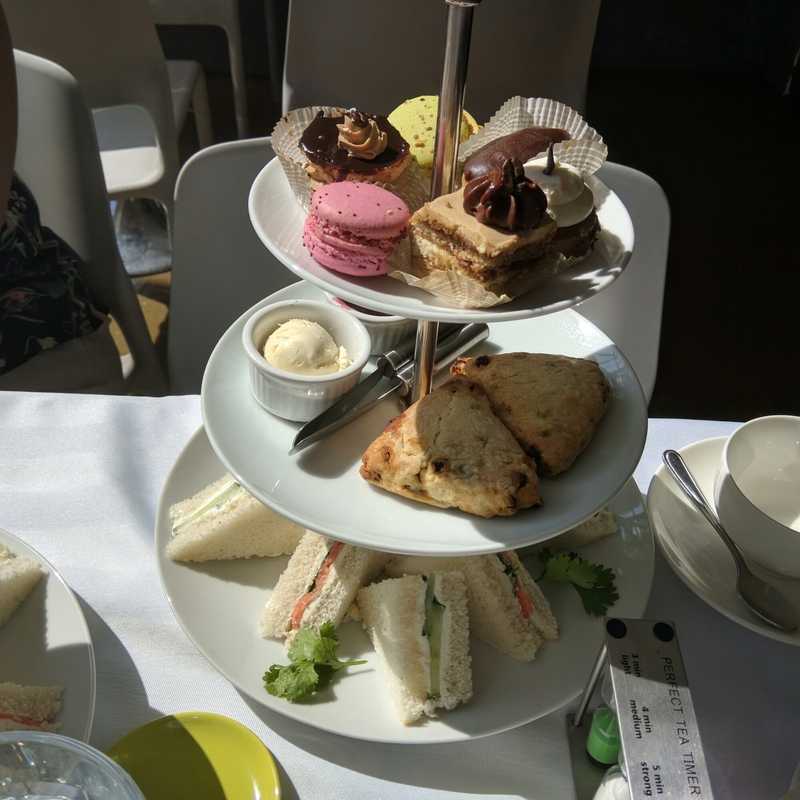 That’s exactly where I spent my afternoon yesterday – drinking tea, eating finger desserts and sandwiches with a tea group. 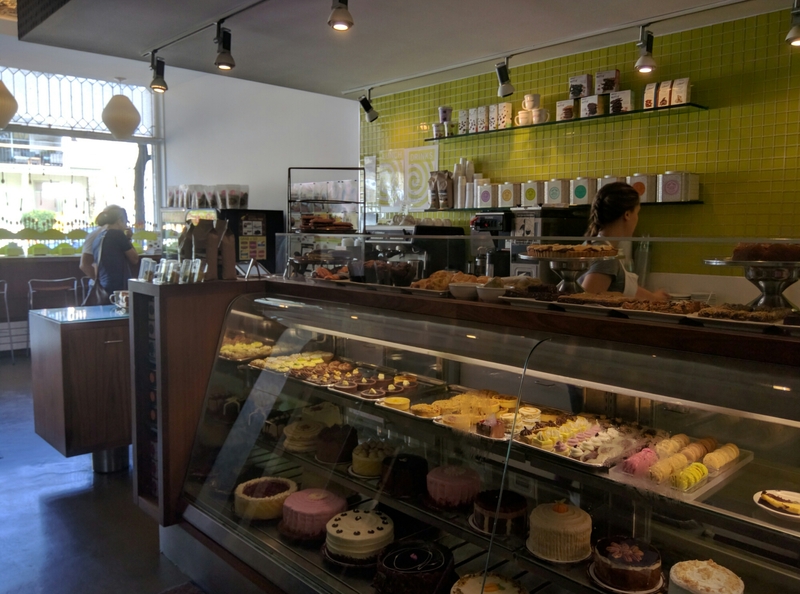 This Dufflet is a cute little spot in the Beaches area and there was a little room in the back of the store where you can eat your lunch or pastry, or have afternoon tea. The place is cute and tranquil, don’t you think? Almost Zen-like. I love the goldfish painting on the wall. The little garden is cute, don’t you think? It was really hot sitting right in the sun. Reservations are needed tho, and they don’t accept large groups – maximum reservation size is one table of four. 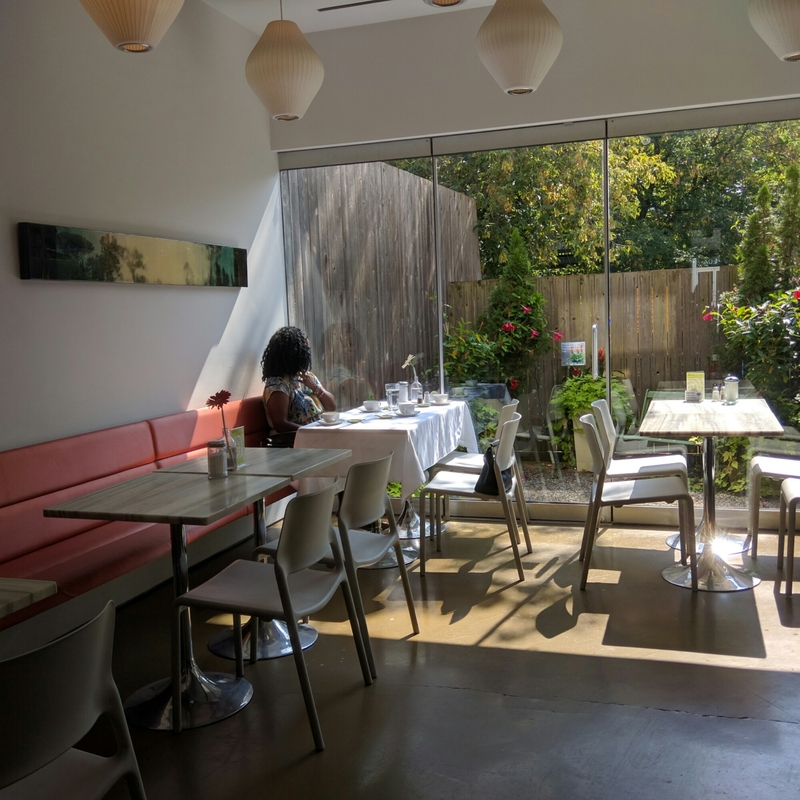 If there is a no show in your group, Dufflet will still charge you for the empty seat. That’s what happened to our group, someone didn’t show up and the three of us had to cover for the no show. So, let’s just say this afternoon tea was on the pricy side for this reason. We each received a pot of tea of our choice. The tea brand was Sloane tea, I believe this tea is high quality. We received two trays of sandwiches and pastries. The sandwiches were of two sorts – smoked salmon with cream cheese, and cucumber with cream cheese. It hit the spot as we were hungry. There was one type of scone with cranberry (very fresh, I enjoyed this), fruit compote and clotted cream. Also a very good selection of finger pastries. I was quite surprised the quality was high. (Much better than that English tea room on Markham Road, that’s for sure. The service was on the unprofessional side tho. It was efficient, but that extra something was not there. I guess customer service really isn’t their forte. Hey Reggie, yes Sloane Tea is magical. 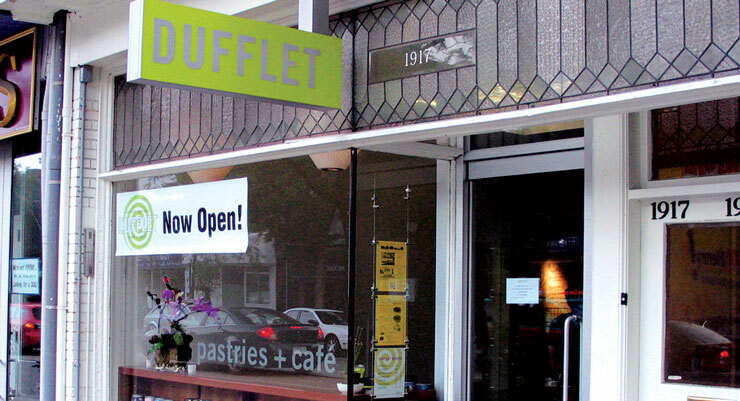 Have you tried their Heavenly Cream tea while you were in Dufflet? I’m from Mississauga and I know that Raw Aura in Port Credit is now carrying Sloane Tea. Hopefully more places in the 905 will carry them! That is the one I had that afternoon – Heavenly Cream. Thanks for the heads up of Raw Aura (always meant to visit this place). I will check out the Brampton place. The best place I went to for afternoon tea is in Niagara Falls. I also checked out the one in Markham, and was not crazy about it.